What is the difference between fisheye and cratering? Things are not always what they appear to be. Often "fisheye" and "cratering" or (dimples) are mistaken or vice versa because their appearance is similar. For example, fisheyes on a surface can be caused by oily residue, surface contamination, or primer/paint incompatibility, but not always the cause. Cratering or (dimples seen in the photo) can be caused by heavy builds possibly applied too fast, or an imbalanced or (unstable) paint formulation. Paints contain surfactants and defoamers. Think of surfactants as soap (lubricant) to allow paint to flow and level. Semi-gloss or gloss paints have a higher level of surfactants compared to flat paints. Defoamers balance the surfactant. Note: defoamers can degrade with age, some have a 12-18 month life span. Surfactants play a role in wetting, coalescent and pigment dispersant agents contributing to the application of coatings, film formation and the development of color. The main difference between fisheye and cratering or (dimples) is that fisheye is caused by something contaminating the surface whereas cratering or dimples are often caused when no surface contamination is present. Are we looking at that small moon crater mark in the paint? I have a quick question regarding orange peel, first coat of woodwork acrylic topcoat I sprayed today went on and levelled out beautifully. Second coat not so good, dried with a slight orange peel. I didn't check the pressure on the first coat. But thought I dialled it in pretty similar. There were windows open in the property on the second coat and not the first. First coat was going on over a fully cured primer, second coat was going over a same day sprayed first coat. I did notice in certain areas on the second coat that the spray pattern was sliding the paint around on the surface rather than laying it down neatly. I just wondering how to minimise if not eliminate that orange peel next time. Whats best way to solve the problem krudcutter? Yes, the moon crater in the reflection. You said a few things in your post that lead me to believe you were too close to the surface for your second coat or you were moving too slow. The thought of you being able to witness the paint doing anything is incomprehensible to me. I just can't image you would have time to notice such a (sliding) effect occur. Not to say its not possible, just seems unlikely thinking about how I spray for comparison. Typically orange peel is going to be related more often to 1) poor atomization 2) too close 3) too slow 4) lousy paint. It can also be related to surface tension, meaning, the first coat produced a poor surface. This can be explained by the fact you didn't experience it applying the 1st coat over the primer coat. This is just one of those areas I would need to physically witness to diagnose properly. Now, the primer coat could also be producing the opposite effect in which the primer surface absorbed the 1st coat which can be witnessed by the fact you say you didn't experience "sliding" at that time. I'll leave it at that and see if that gets you thinking anything different. Fisheyes are caused by something on the surface that is causing a disturbance in the wet film to occur. Krud Kutter is a good overall cleaner and should produce a clean surface for general cleaning, but Krud Kutter may not effectively clean all contaminates from the surface. Knowing what might possibly be on the surface will help identify which cleaner to use. 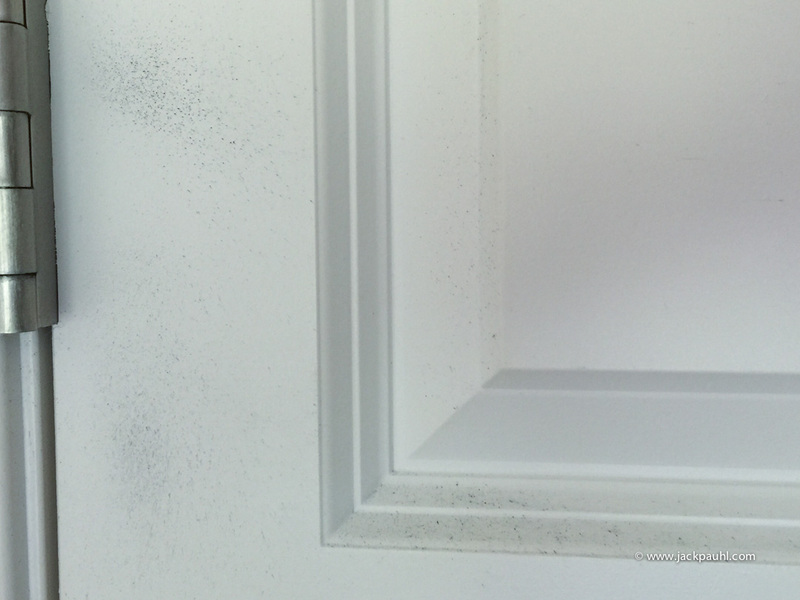 Here is one example, the silicone lubricant used on the door hinge in this photo is causing cast-off spattering across the door. It extends nearly all the way across the width of the door. If the lubricant is not properly removed, fisheyes may occur. Not sure what fluxaf is. I've used lacquer thinner to clean some surfaces. I've also cleaned surfaces and sanded them. It just depends on what you are looking at. 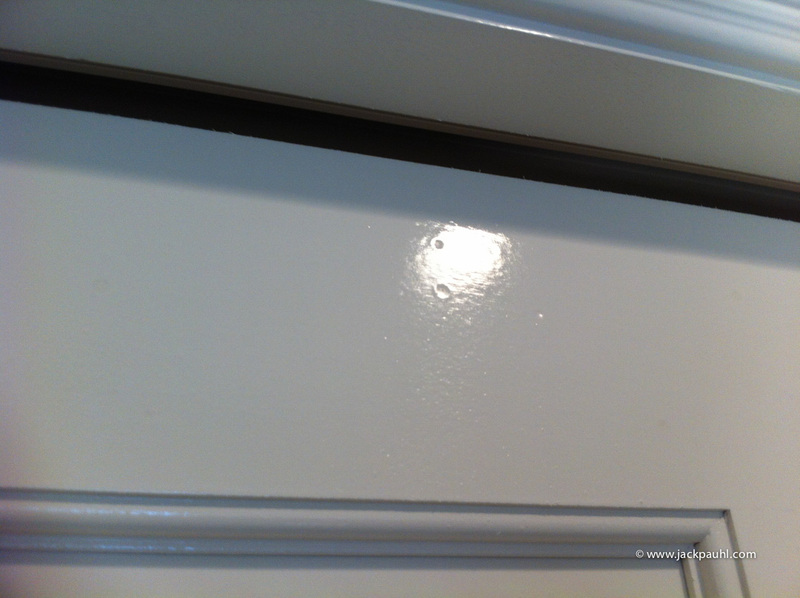 We should always be sanding everything we paint so typically sanding does a good job at removing unseen contaminants. Do you that on wood and walls?